Minimum quantity for "Infinity Perfume Gift Set - Infinity Compare to: Eternity 3PC" is 1. 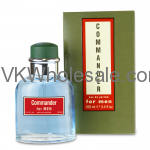 Minimum quantity for "Unity Squad Perfume for Men 3.4 oz 1 PC" is 1. Minimum quantity for "Le Blanc for Men 3.4 oz 1 PC" is 1.